The Fieldbus Foundation today announced approval of a backhaul architecture model, developed in collaboration with International Society of Automation standards committee ISA100 that provides a common framework enabling multiple industrial communication protocols to run over a shared wireless backhaul network in process automation systems. Completion of this work is a key milestone supporting implementation of the Fieldbus Foundation’s wireless High Speed Ethernet (HSE) backhaul included in FOUNDATION for Remote Operations Management (ROM) technology. In June 2008, ISA100 leaders established a new working group, ISA100.15—Wireless Backhaul Networks Working Group—to develop standards and technical reports to address one or more dedicated or shared wireless backhaul(s) to support technologies running multiple applications. At the same time, Fieldbus Foundation end user members identified the wireless backhaul as critical for FOUNDATION for ROM development. To expedite the work, the Fieldbus Foundation and ISA began joint collaboration on wireless networks combining Fieldbus Foundation application protocol expertise with ISA100 communication networking resources to complete the architecture model. ISA will publish the work as technical report ISA-TR100.15.01, Backhaul Architecture Model: Secured Connectivity over Untrusted or Trusted Networks, within the ISA100 family of standards. Dr. Penny Chen, principal systems architect with Yokogawa and co-chair of the ISA100.15 working group, praised the results of the wireless backhaul collaborative effort. “Working together, dedicated engineers have a developed a solution meeting industry requirements for a wireless backhaul transport network to facilitate interoperability, end-to-end security, and end-to-end quality of service in industrial wireless installations,” Dr. Chen said. According to Glanzer, plans are underway for a series of field demonstrations using the FOUNDATION for ROM wireless HSE backhaul. Major end users hosting the demonstrations include Reliance Industries (India), Petrobras (Brazil) and Saudi Aramco (Saudi Arabia). Additional end user sites in Japan and Europe are expected to join the program. The field demos will offer a look at the full functionality of FOUNDATION for ROM, including wireless device integration, remote I/O integration, and wireless backhaul capabilities. FOUNDATION for ROM was designed to enable fieldbus connectivity to remote I/O and the leading industrial wireless protocols, and is the first successful integration of ISA100.11a, WirelessHART®, wired HART®, and wired H1 protocols into a single standard environment without sacrificing the diagnostic capabilities of existing wireless devices. Instead, these capabilities are mapped into the FOUNDATION block structure to provide a standard environment for data management and quality, eliminating techniques which are highly customized and much more costly to maintain throughout the plant lifecycle. As part of this solution, FOUNDATION for ROM provides a way to bring large concentrations of discrete and analog field I/O back to the control room using HSE communication. It also employs Electronic Device Description Language (EDDL) and function blocks to ensure interoperability with FOUNDATION for ROM devices. This is essential to improve integration of critical functional areas, including machinery health monitoring, safety interlocks, fire & gas detection systems, and video surveillance. To learn more about FOUNDATION for ROM, go to http://www.fieldbus.org and select the ROM navigation button, or call (512) 794-8890. For more information about ISA100, visit http://www.isa.org/standards. We held our end user and sales force training seminars in King of Prussia, Pennsylvania last week, just outside of Philadelphia. 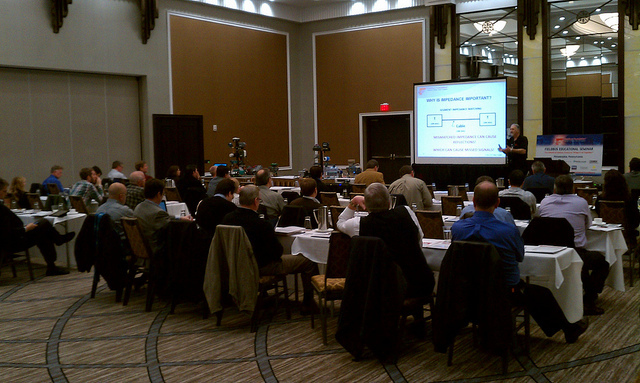 We had a very good crowd for both the end user seminar on Wednesday and the sales force training seminar on Thursday. It has been a long time since we visited the Pennsylvania/New Jersey/Delaware area, but we have many fieldbus end user sin this area from the life sciences industry to chemicals and refining, as well as a some large suppliers including ABB, Honeywell, and Siemens. For those of you that have not been to one of our end user seminars, we include presentations from some of the leading voices in fieldbus. David Lancaster of our FOUNDATION Certified Training Program partner Trine University and formerly of Bechtel does a series of presentations on engineering, installation, and commissioning. John Rezabek of Ashland Chemical and chairman of our End User Advisory Council provided excellent presentations on the value of the FOUNDATION fieldbus user layer, control in the field, and how to use FOUNDATION fieldbus diagnostics. Following the presentations, our host system demo sponsors step in and do a real life demonstration of the technology, these include a Yokogawa host system demonstration of how to commission a device, an Invensys host system demo of control in the field, and an Emerson host system demonstration of device diagnostics. The demonstrations follow the phases of the fieldbus project lifecycle, from engineering and design through installation, commissioning, operations and maintenance. Special thanks go out to the local ISA chapter, who really helped us get the word out to potential attendees. 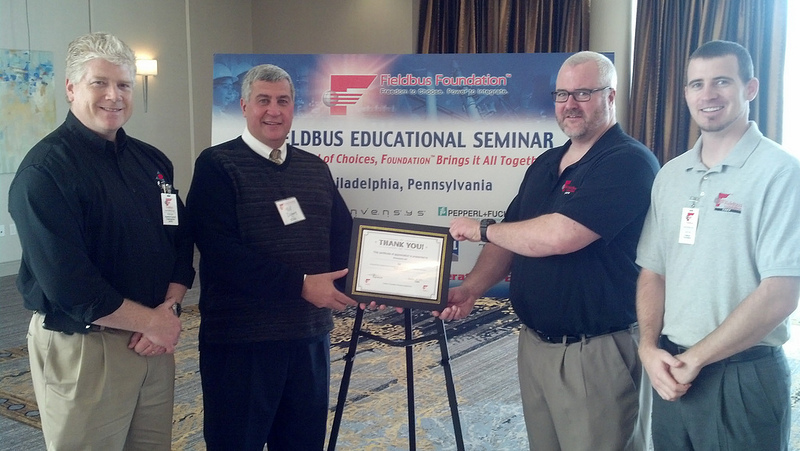 We presented ISA Philadelphia Section President Bill Dugary with a certificate of appreciation and offered one time discounts on ISA fieldbus related books for the seminar attendees. We look forward to our next visit to the Philadelphia area.